Each year, the National Hockey League is adding more players of color. Importantly, many of these players are stars or headed toward stardom. Black and interracial NHL players used to be extremely rare. Now, there are few teams without one. This is why the racist episode in Chicago last Saturday is so disgusting. The racism is obvious even though some Americans are finding ways of excusing these four cretins because they didn’t use profanity or the N-word. 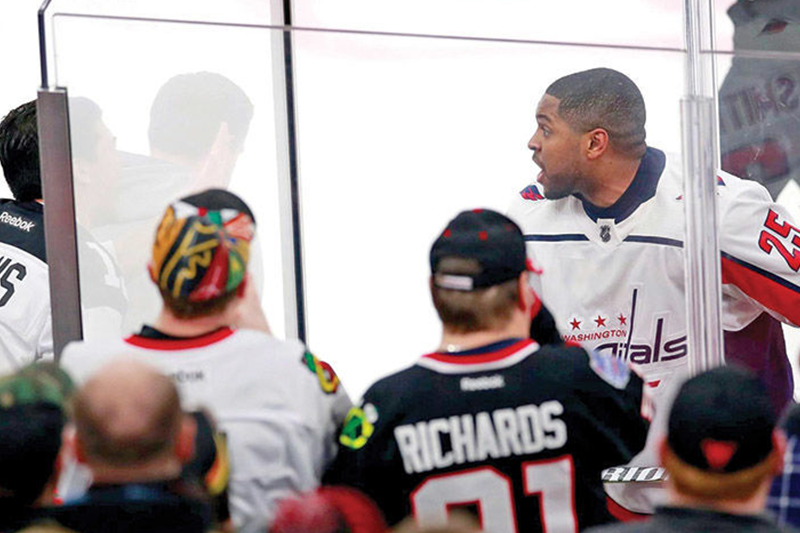 Smith-Pelley says he and other players of color still must tolerate racial taunts, but this time he had enough. He tapped his stick on the glass separating him from the idiots in question and was ready to discuss the matter face-to-face. “We’re at a time now where you can’t brush it under the rug,” he said following the game. Smith-Pelley is one of 30 black players in the NHL. He is in his seventh season and this is his first with the Capitals. 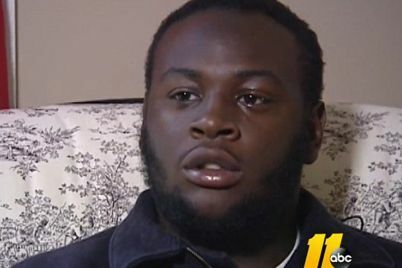 He has seven goals and nine assists – and this is not his first run-in with racist fans. Last season, he told the Toronto Star that he was told “go back to playing basketball” during a rookie tournament in British Columbia. “I can’t go to anyone on my team and have them understand really how it is to be in my shoes. Just because I’m a professional hockey player: they just don’t understand. So, it’s really lonely in that sense. You don’t really have anyone,” he said. The Chicago incident was captured on camera, which is probably why it is receiving much attention. Some of those ignorant people work in the White House. The Blackhawks took action. The four fans have been banned from home games. “We have contacted the select individuals involved in the incident on Saturday to notify them that they are no longer welcome at our home games,” spokesman Adam Rogowin said. The folks in question will probably find ways to sneak into an occasional game at the United Center. They also could travel south down I-55 and catch a Blackhawks game in St. Louis. I wonder if the Blues fans sitting near them would call them out, or cheer them on. The NHL incident happened days after LeBron James of the Cleveland Cavaliers and Kevin Durant of the Golden State Warriors were interviewed by Cari Champion on the online network Uninterrupted. They were critical of the president and spoke candidly about race and social justice in America. The nerve of them Negroes. Within hours she was defending herself, saying that the comments were not racist. She invited James to be on her show. Don’t hold your breath until that happens, Laura. Ingraham’s comments are indeed racist because she is ignoring two of the president’s most vocal critics and champions of social justice: San Antonio Spurs coach Greg Popovich and Warriors coach Steve Kerr. Popovich was asked the importance of the NBA’s annual salute to Black History Month.